Looking for a creamy way to cool off? Check out some of HG's fave chilly ice cream novelties... And keep an eye out for MORE of our Freakishly Good Frozen Finds -- coming your way soon. OK, we don't even love cheesecake. Or raspberries, for that matter. Or even dark chocolate. 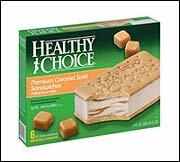 But still, we can safely say that this is one of the BEST tasting ice cream bars EVER. No sugar added reduced fat cheesecake ice cream is infused with cheesecake pieces and a raspberry swirl, then dipped in smooth dark chocolate. These things are so decadent and delicious, your head just may explode when you eat one. With 10g of fat, though, this bar should be eaten only every once in a while when cheesecake cravings are too strong to ignore. White chocolate lovers, rejoice! 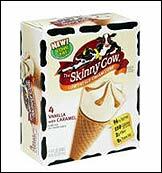 The guilt-free ice cream world has NOT forgotten you. 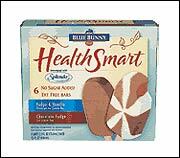 These slim but satisfying bars are made of light vanilla ice cream dipped in white chocolate and diced almonds. Brilliant! These treats are extremely unique (not to mention delicious). Featuring low fat cookies & cream ice cream covered in cookie bits, these large and in charge pops certainly live up to their name. These cookie-licious treats will kick cravings for oreos, ice cream sundaes, chocolate and more. 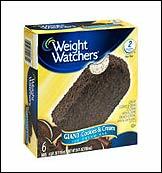 WE HEART YOU, WEIGHT WATCHERS GIANT COOKIES 'n CREAM BAR! There, it's out of our systems. Leave it to our friend the svelte heifer to come up with yet another smashingly sensational sweet treat for the diet-conscious. These crispy cones are lined with chocolate, then topped with either chocolate or vanilla ice cream. The chocolate cones are drizzled with chocolate syrup (for a triple chocolate punch! ), and the vanilla is topped with gooey caramel. Yum! Unlike any ice cream sandwich we've ever had before, it's hard to believe this vanilla ice creamy, caramel infused, cookie snuggled dreamboat of a treat contains just 140 calories. That's crazy! In a good way. This one's a must-taste for vanilla-lovers. Pssst...we hear there are die-hard ice cream fans that REFUSE to believe this sandwich is guilt-free in any way. Ice cream novelties were first introduced in the 1920s, and 50% of all frozen bars & treats are consumed by adults. Share these creamy frozen finds with humans you enjoy. Click "send to a friend" NOW!